Folks, that is what I am having for lunch today. 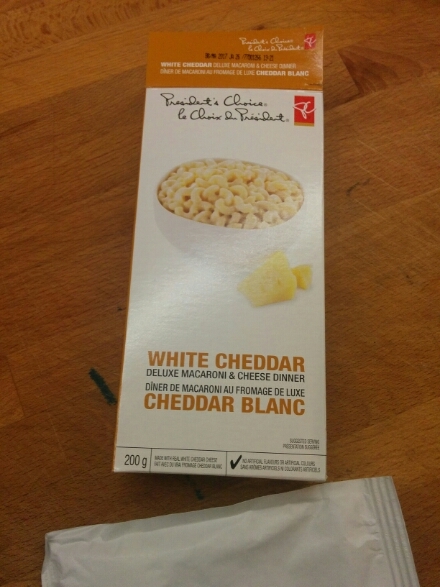 Only Canadians or Canadian-adjacent people know the comparative glory of this particular no-name-brand boxed mac and cheese. If Kraft Dinner ain’t your thing, this is not an alternative to take lightly. I order it from Canada by the case. And no, before you ask, the President’s Choice imprimateur shouldn’t be Prime Minister, because it’s the president of the grocery company they’re referring to. This is the Loblaws (and other grocery chains) store brand.